1 Kr., 3 Kr., and 6 Kr. 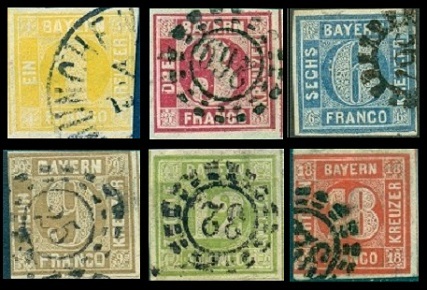 Bavarian stamps were first issued November 1, 1849, giving the Kingdom of Bavaria the distinction of being only the 11th country in the World to issue adhesive stamps for the prepayment of letter postage. The 1 Kr. postage stamp shown above (Mi. #1I, Sc. #1) was issued on November 1, 1849, with additional printings continuing through 1850. This stamp is imperforate, as are all the numeral issues, and it was printed on normal paper without security threads. Two plates were used for this 1 Kr. denomination stamp. Their characteristics are as follows. Plate I - Rough impression. Frame lines around "1" are broken or incomplete. Plate II - Fine impression. Frame lines around "1" are complete. The stamps from Plate 1 are the commonest of the two plates. Due to the rarity of this issue, forgeries are frequently encountered, so examples should be purchased that have either certificates or expert certification markings on them. 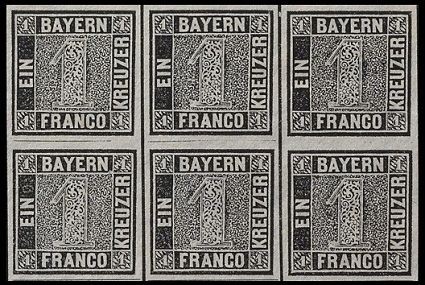 The two additional denominations of Bavarian stamps, the 3 Kr. (Type I - Plate 1) and the 6 Kr (Type I - Plate 1), shown above (Mi. #2I, #4I, Sc. #2-3) were also issued in November 1849. These two stamps are imperforate and are printed on paper with silk security threads, as were all the remaining numeral issues through 1862. There are two major types. Type I - There is a "broken circle" around the numeral in the center of each stamp. The lattice work pattern along the inner frame ends in a sharp angle to the inner frame lines. Type II - The "complete circle" effect around the numeral in the center of each stamp. The lattice work "flows" into the inner frame line, having the effect of being a "complete circle". The 3 Kr. denomination was printed from five plates, between 1849 and 1862. The 6 Kr. denomination was printed from three plates, between 1849 and 1862. Both of the 1849 printings of these two stamps are very scarce. The later printings of the 3 Kr., from Plates 2-5, and the later printings of the 6 Kr., from plates 2-3, are common. The five new numeral-type stamps shown above (Mi. #3-7, Sc. #4-8) were issued between 1850 and 1858. Their technical attributes are the same as the previous issue, however these stamps include new colors and three new denominations. The 1 Kr., 9 Kr., 12 Kr., and 18 Kr. denomination stamps are all Type II -- the "complete circle" variety, described in the previous section. The 3 Kr. denomination stamp, in blue, with the "broken circle" variety was continued through this period, and the 6 Kr. was now printed from a new plate having the "complete circle" variety. The six new numeral-type stamps shown above (Mi. #8-13, Sc. #9-14) were issued during October 1862. These new stamps feature color changes. These stamps continued in use, until the numeral definitives were replaced in 1867. On a comical note ... all the Bavarian stamps of the numeral design were printed in sheets with colored separator lines between each of the stamps. This was a great idea, in that it would allow the stamps to be evenly trimmed, when cut apart for sale at the post office. But, either the postal clerks or their patrons didn't know what the colored lines were for or didn't pay any attention to them, as you can see from the many examples shown on this web page. 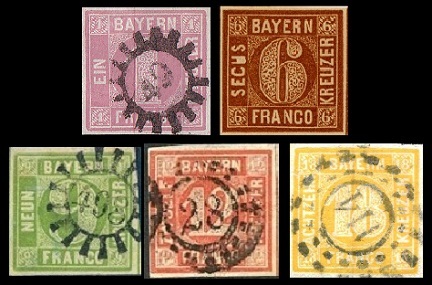 The Bavarian stamps of the Numeral issues offer a wonderful opportunity for the philatelist, wishing to make a specialized study of this issue. There are a multitude of shades, plate varieties, plate faults, and cancellation varieties on all of the different stamps of this issue. They are all described in detail in the Michel Deutschland Spezial Katalog - Volume I.